Alive in Brooklyn, Vol. 2 is the second album from this excellent freewheeling trio. Pianist Angelica Sanchez and her husband, tenor saxophonist Tony Malaby, share their intuitive rapport with resourceful drummer Tom Rainey on another set of nebulous and visceral improvisations recorded at Barbès, one of Brooklyn's best new music venues. Sanchez once again eschews acoustic piano for an electric Wurlitzer, invoking the brooding atmospherics of late-1970s fusion as well as the aggressive pointillist attack of that hallowed genre's more impetuous artists. Malaby is a masterful tenor stylist: capable of both paint-peeling multiphonic excess and subtle harmonic experimentation, he is able to compress the big horn's timbre down into the range of a flute. Rainey is a longtime Downtown scene veteran. His varied experiences have endowed him with a deep wellspring of creativity, veering from nuanced, rubato brush work and angular metered grooves to throttling tribal rhythms. The brilliantly recorded set opens with "Ventriliquism," a spacious and atmospheric meditation that builds to a fractious call-and-response coda. Gradually gaining intensity and momentum, "...The Other Ear" rises to a roiling climax of thundering drums, kaleidoscopic electric piano and turbulent tenor cries. Demonstrative of the trio's primal power, it is amalgam of New Thing-era expressivity amplified by fusion's electric polytonality, yielding a rousing, singular hybrid. "L'avenir" and "Pincherama" are slightly more subdued, but still intricate and conversational. The later tune begins with Malaby's unaccompanied tenor solo, which reveals a wealth of ideas before the trio knits together a labyrinthine quilt of swaggering, deconstructed funk. These fully improvised pieces embody a truly symbiotic sentiment, a sense of focus and conceptual intent lost in some free improvisations. Even without settling into typical rhythmic patterns or harmonic frameworks, the trio manages to insinuate forward momentum with a linear logic that reveals abstract lyricism. Working collectively, Malaby's horn stands on equal footing with Sanchez's electric piano, and Rainey's drums provide as much harmonic color and texture as they do fluctuating rhythm. Conversational in the extreme, this is one trio that listens as well as it plays. Visit Tony Malaby and Angelica Sanchez on the web. Track Listing: Ventriliquism; ...The Other Ear; L'avenir; Pincherama. 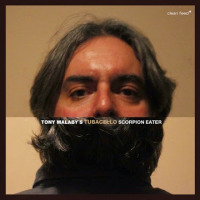 Personnel: Tony Malaby: tenor saxophone; Angelica Sanchez: Wurlitzer electric piano; Tom Rainey: drums.